There can be nothing more traditional on a cold winter’s day than a lamb stew with dumplings. Come home to a meal that has been simmering on the hob and walk in to the rich welcoming aroma of lamb and you are at one with the world. Dumplings, where once served as a cheap meal but that may be a tad on the fattening side but eaten in moderation they can be enjoyed by all. Although lamb is no longer the cheapest meat to purchase by using the right recipes and the cheaper cuts of meat your family can enjoy a delicious lamb dinner quite often. Cuts such as breast, neck and scrag end are all good for stewing as they are cooked slowly for a long time and become very tender. Do not be tempted to remove the meat from the bone as part of the delight of lamb recipes is that you can eat the meat from the bone at the dinner table. Winter root vegetables are delicious with lamb stew recipes and are not expensive to purchase. For those new to cooking supermarkets often sell a stew pack of vegetables such as potatoes, carrots, onion, parsnip, turnip and swede. When chopping up these vegetables leave them in fairly large chinks so that they do not cook away to nothing during the long simmer time. Modern variations of stew include shallots and mushrooms and one vegetable that brings out the flavour of lamb is the leek. Traditionally lamb stew would last over a few days and be topped up. Heat the oil in a large stock pot or stew pan. Add the lamb and brown all sides. Add the onion and leeks. Once softened add the vegetables, pearl barley, garlic, herbs, stock cube, seasoning and enough water to cover the ingredients. Bring to the boil and turn down and leave to simmer for around three hours replacing the lid of the pan. If you do not want dumplings then thicken the stew with gravy granules or a roux of flour and butter and serve. A really tasty accompaniment to stews and curries. Mix the flour and suet and season to taste. Add water to bind without making the mix too wet. 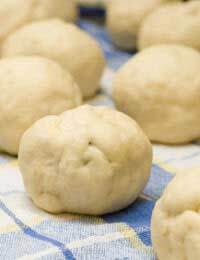 Divide into eight dumplings and roll into balls with floured hands. Add to the stew for the last twenty minutes leaving the lid off the pan so they can rise without being restricted. The residue of flour should thicken the gravy of the stew. Serve in large bowls with fresh crusty bread to soak up the delicious gravy.